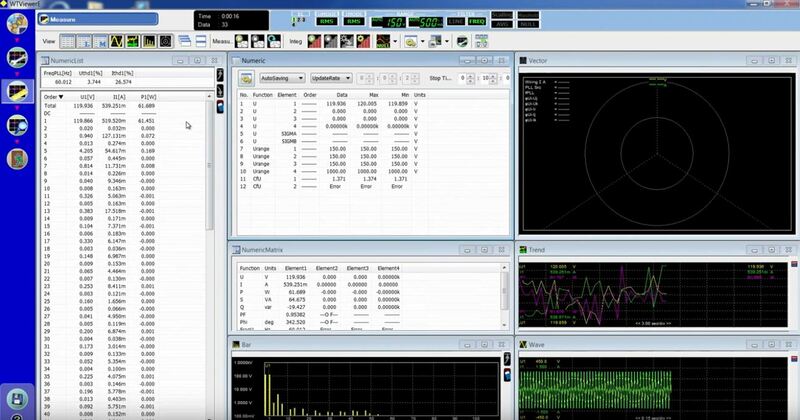 WTViewerE software enables PC connectivity for Yokogawa power analyzers such as the WT3000E/ WT3000, WT1800E/ WT1800 , WT500 and WT300E/WT300 through Ethernet, USB, GPIB or RS232. With multichannel measurements, multi-unit connectivity and multilingual support, the WTViewerE allows users to easily control, monitor, collect, analyze, and save remote measurements from up to any 4 power analyzers simultaneously. WTViewerE allows users to analyze and control remote measurements in real-time or use previously acquired data. In the online mode, users have real time control of measurements from each connected instrument, allowing them to remotely start or stop integration or collect live measurement values. In the offline mode as well users can analyze the latest acquired or previously stored data. 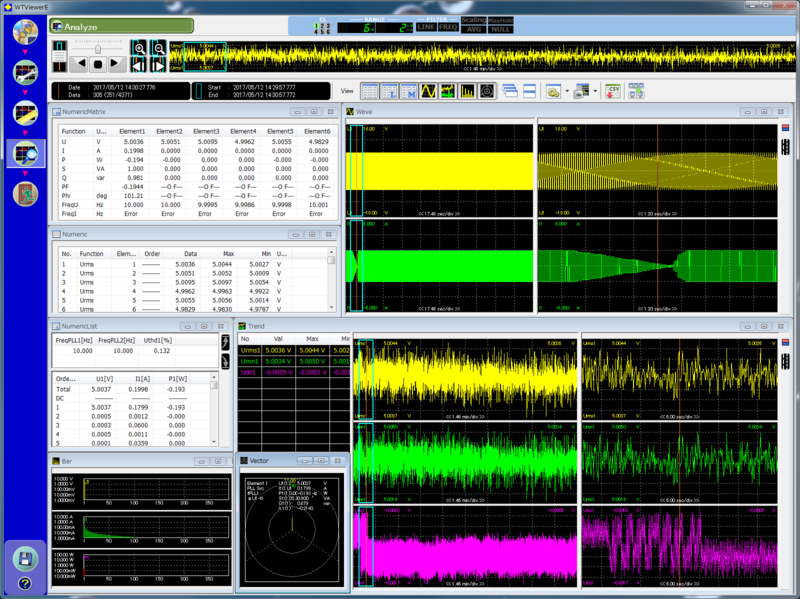 With the WTViewerE, users can simultaneously view up to 12 waveforms, 8 trends, 8 vectors and 6 harmonic bar graphs in split screen mode or zoom in using cursors for more detail on a particular area of interest. Users can also customize, save and load screen layouts as well as specify the data to be saved in CSV format. The software also allows users to create custom computations combining values from multiple power analyzers. WTViewerE enables synchronized measurement of up to four WT instruments in any combination regardless of model, element type or optional modules. The software auto detects connected instruments and displays a list from which users can modify wiring systems, voltage and current ranges, update intervals, synchronization sources, display formats and other measurement conditions. With customizable split screen display of readings in numeric, bar, trend or vector formats, the WTViewerE simplifies the acquisition, storage and analysis of multichannel measurements from up to 4 power analyzers simultaneously. Perform user defined computations combining values from multiple power analyzers. 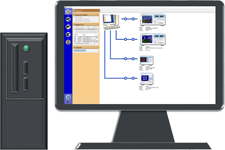 Save or load configurations, measurement data, screen layouts and more. The WTViewerE allows simultaneous connection of different WT series models. It also allows simultaneous connection of the same models with different input element types/numbers or different options. *1 Harmonic measurement option must be installed in the WT300 or WT300E. *2 Harmonic measurement option must be installed in the WT. *3 A vector window cannot be displayed on the WT300 or WT300E. 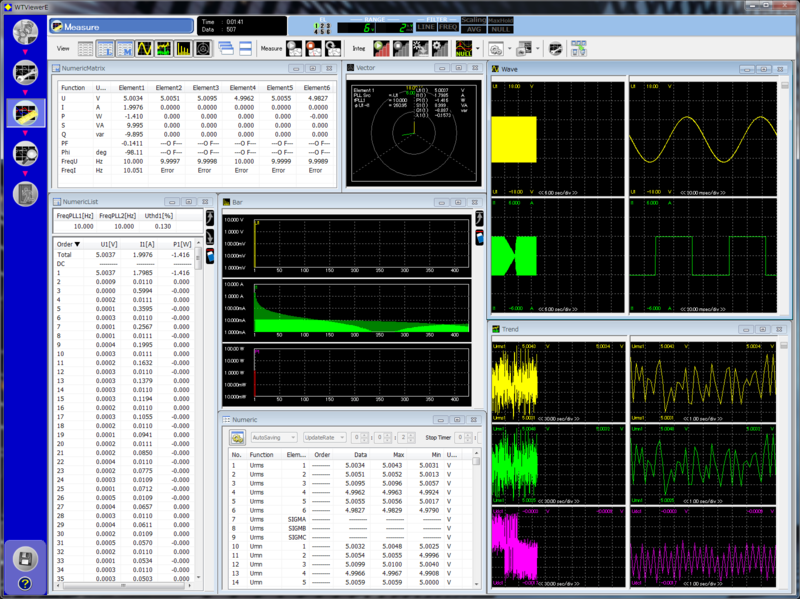 Data Acquisition Interval:50 ms at max. speed. - The data storage period can be any custom settings (more than 20 seconds) and the data update rate of the product. - Depends on your PC's processing speed, the communication interface is use, and the number of data points that the software is collecting from the WT. - When the data acquisition interval is 500 msec or less, dropout of waveform data will occur on regular basis. On Windows 7: Use driver NI-488.2 Ver.2.7.2 or later. On Windows 8.1: Use driver NI-488.2 Ver.3.1.0 or later. On Windows 10: Use driver NI-488.2 Ver.3.1.0 or later. On Windows 7: Use driver NI-488.2 Ver. 2.8.1 or later. On Windows 10: Use driver NI-488.2 Ver.15.5.0 or later. On Windows 7: Use driver NI-488.2 Ver. 14.0 or later. Operating System Must be compaible with the operating systems listed above. This software saves all displayed measured data. Depending on the combination of setup items that affect the data size, the data may exceed 1 TB.